Discover the unbridled purity of beautiful materials in the latest 2018 wedding dress collection from Inmaculada Garcia! 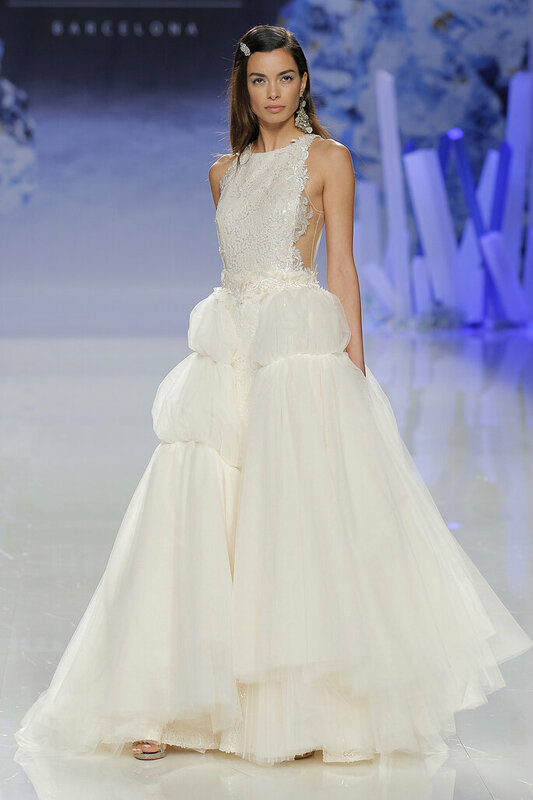 A name not to missed year after year on the Catalan catwalk is Inmaculada Garcia. With a specific style which has come to define her, this designer has turned it up a notch this year, presenting a 2018 collection which relies on the purity of exquisite fabrics. The new collection is aptly named Purity, and draws inspiration from the luminosity of fabrics, prioritising beautiful designs and elegance as essential trends. 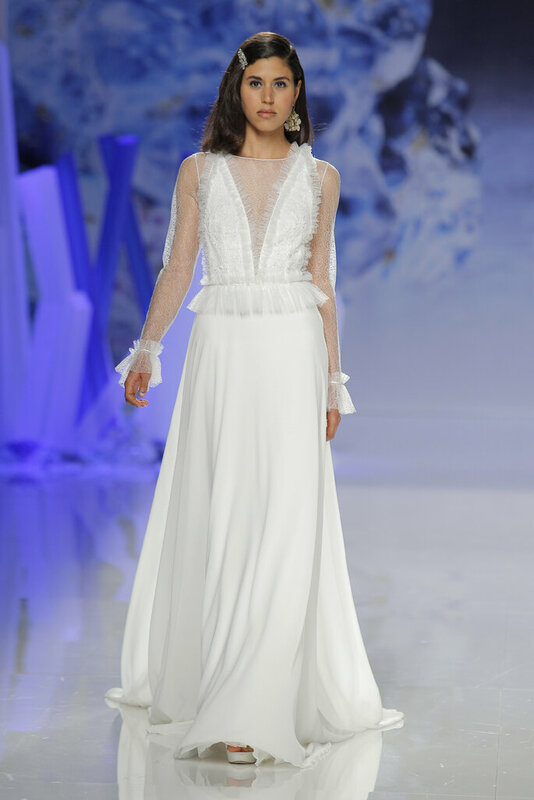 Check out our post for all of the looks from the new Inmaculada García wedding dress 2018 collection and get inspired by the most stylish designs around. The show was about to begin, everything was prepped and ready, the cameras ready to flash and the audience eager with anticipation. Then the stage erupted into clean, pure sounds of glass and ice. The models began to strut their stuff down the runway and unveil the surprising new selection of designs which make up the new collection for brides this year. A true fusion of elegance, fabrics, and above all, innovation. Inmaculada has taken a turn with her new collection, combining cuts which ooze femininity with exquisite detailing and superlative accessories, adding a touch of glamour to proceedings. Glittering earrings and bracelets brimming with jewels, bridal handbags, oversized necklaces, designs which include jewels cascading over the entire back, veils, overskirts, capes… the new collection is one giant spectacle to be seen. 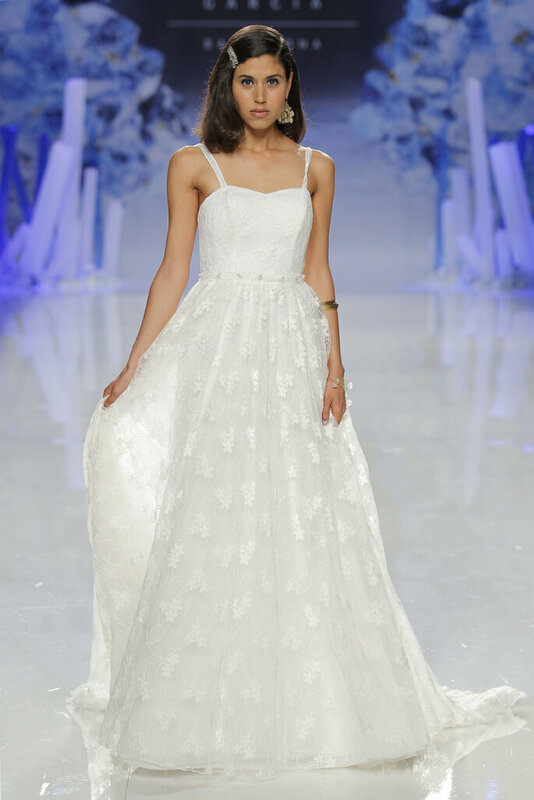 Amongst the designs on show, we’ve noticed a trend for wedding dresses with illusion necklines, two-piece designs made up of daring lace pants and voluminous skirts which go hand in hand with narrower, more simple designs. Ideas for every woman. But, above all, what stands out most from this new collection of wedding dresses from Inmaculada Garcia 2018 is without a doubt the balance she strikes between materials like tulle, embellished with gemstones. pleated skirts which are also embroidered, silk printed organza, embroidered mesh and chantilly lace. 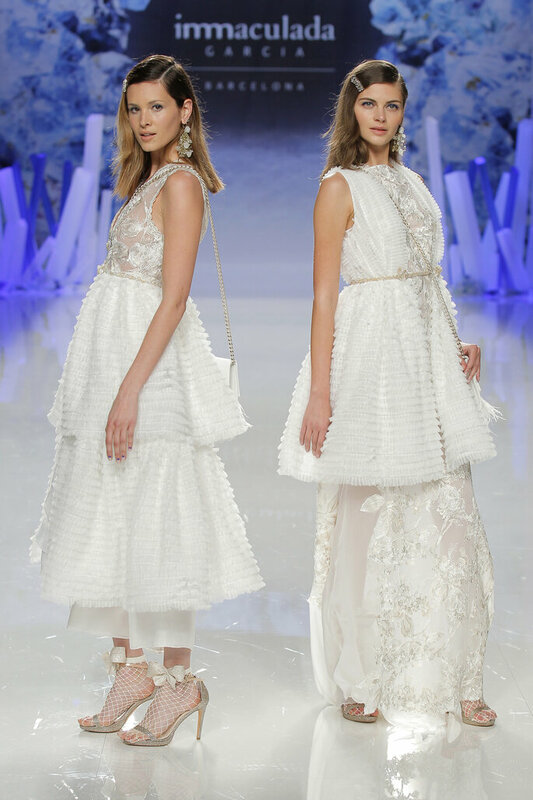 The French sleeve, balloon sleeve and long sleeve appear in several of the designs, with exquisite lacework. Word of honour necklines also make an appearance, as do deep V-necks which extend to the waist, with transparent overlaying adding a sensual touch. All in all, designs which gather three very different lines, all of which make up Inmaculada Garcia’s distinct identity. A romantic line, My Essentials, made up of understated designs of lace, gauze and tulle, with elegant shapes. The second line, My Couture, boasts haute couture designs, delicate, voluminous, and diaphanous. These designs are realised in organza, stamped silk, paillette, gemstones and tulle embroidery. And last but not least, My Secrets is the third and more relaxed line, lacking volume, but boasting fairytale and fluid tulle, mesh embroidery and V necks. 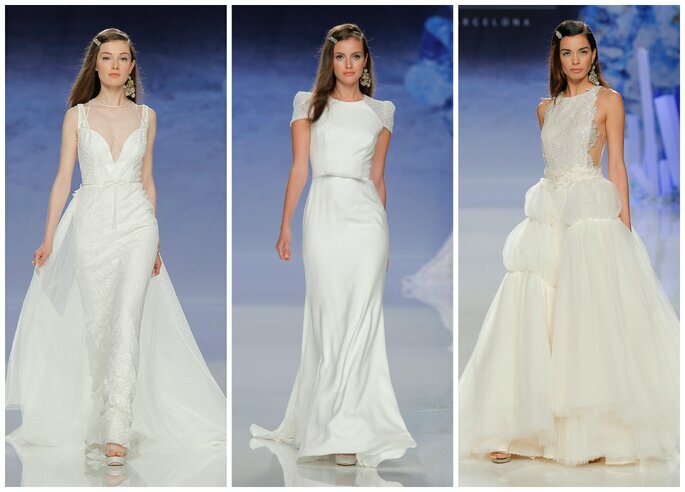 Seduction in its purest form and a very French vibe in this latest collection of wedding dresses from Inmaculada Garcia. Purity and fashion come together to form a combination we’ve fallen head over heels for.